As near as I can tell they’ve stopped watering the grass in the back half of this park. 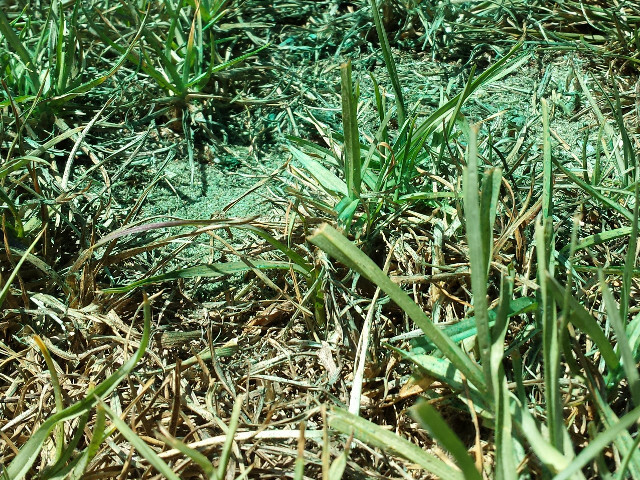 The grass around the edges, near the playground, and near the clubhouse is green but scraggly. 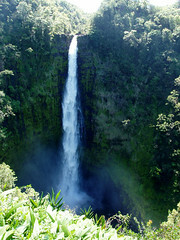 I’m not sure how they’re watering the trees, but most of them seem to be finding enough water to have put out leaves. Away from the street view, the ground is mostly dirt and dead grass now, but you can really see where the runoff collects. 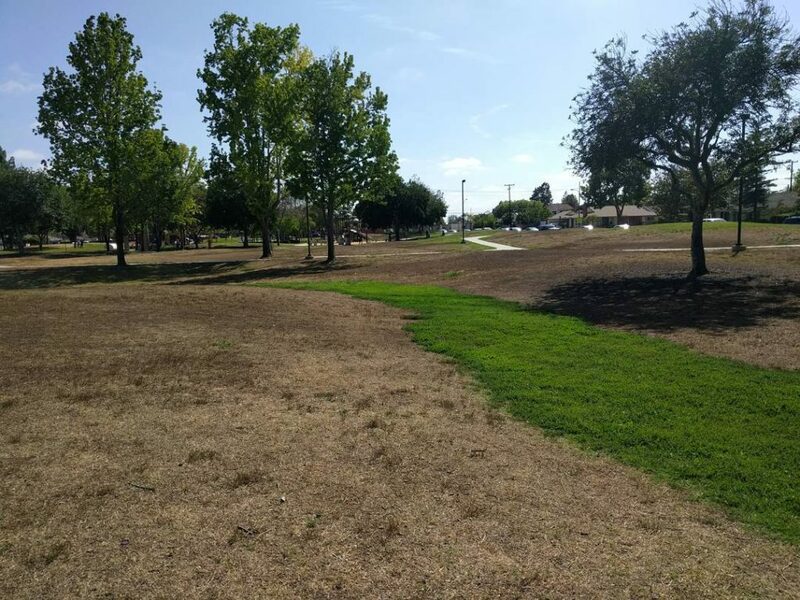 This entry was posted in Photos and tagged California, drought, grass, parks on June 1, 2016 by Kelson. It’s been a relief to have (relatively) cold weather this winter. Last year I think I wore a sweater once. While the rest of the country was caught in the frozen grip of a meandering polar vortex, California was so warm people were going to the beach to cool off. Not that December heat waves are unheard of, but it’s usually only a few days. Last winter the state barely got any snow, which meant we’ve been really relying on reservoirs and groundwater this year. Even if it holds, and we get a wet winter in the lowlands and (enough) snow in the mountains, it’ll take a while to climb out of the current drought. 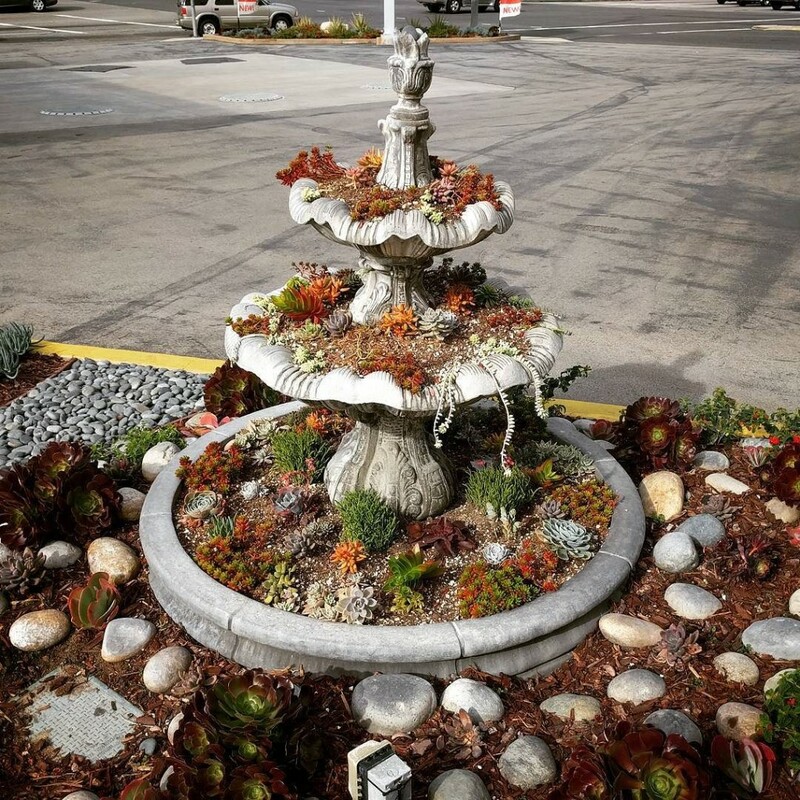 So I’m always happy to see new water-saving measures put in place, like this fountain at a gas station that’s been re-purposed as a drought-friendly planter. 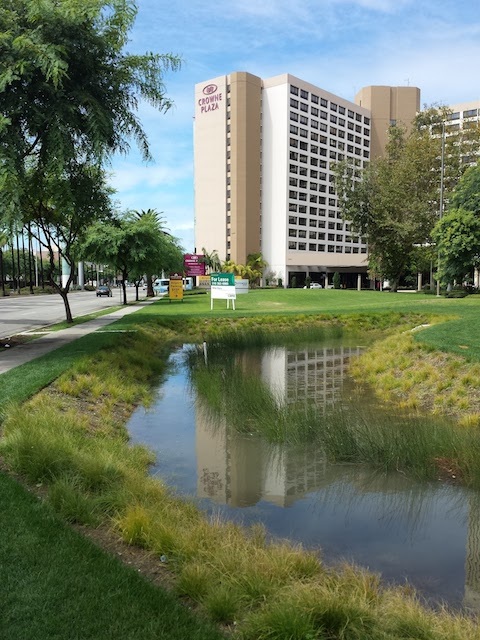 This entry was posted in Photos and tagged California, drought on December 29, 2015 by Kelson. Storm water pond: Now with added storm water! It rained pretty hard last night near home, and clearly it rained hard enough here that mud was flowing over the sidewalks, and the stormwater detention pond still had water at noon. It’s funny how, four years into the worst drought in ages, we’ve had one of the wettest summers on record. 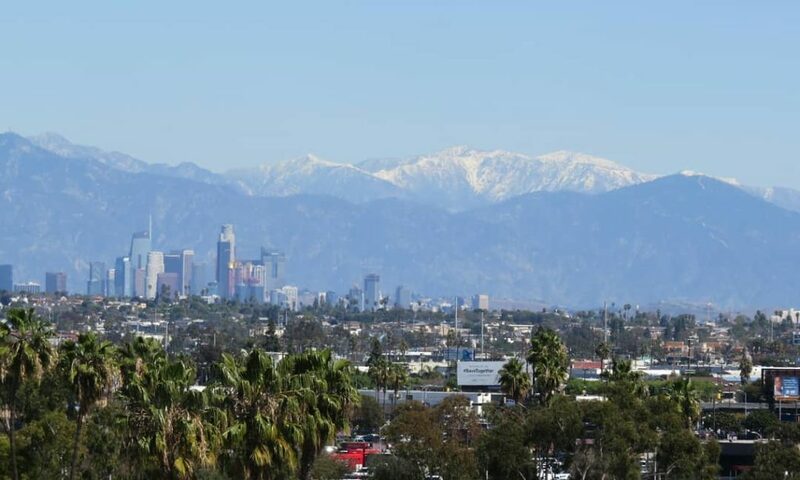 Considering that LA usually gets no rain to speak of during the summer, that’s not saying much, but we’ve had several storms strong enough to cause floods and mudslides in the middle of a drought. We’re all hoping for a wet winter. On a related note, yes, they’re still watering the lawn too much here. At least there’s a lot less of it than there used to be before the renovation, between the hollow and all the planters full of native and otherwise less-thirsty plants and wood chips behind where I was standing. Also, ZPizza opened earlier this month, completing the trio of restaurants on the ground floor of the new hotel. More lunch options! This entry was posted in Photos and tagged drought, Los Angeles, Rain on September 15, 2015 by Kelson. To save water in this multi-year drought, California cities, homes, and businesses have stopped watering medians, replaced landscaping with more drought-tolerant plants, cut back on watering lawns just enough that the grass won’t completely die, and switched to reclaimed water for irrigation (often with signs letting you know it’s recycled — partly so that you don’t try to drink it, and partly so that you don’t call the water police on them). Manhattan Village Mall, it seems, doesn’t want to appear downscale with brittle yellow-brown grass, so they’ve set up their landscape for renovation, giving that lawn a fresh paint job. I looked up close: it’s powdered green paint. It’s way too green compared to anything else I’ve seen this summer short of Astroturf, and that includes the office building near work that still over-waters their lawn to the point that it’s sometimes muddy when I walk out there at lunchtime. It’s also just blue enough to look wrong, though it didn’t quite come through in the photos. 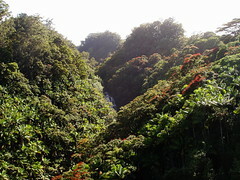 There are plenty of plants with slightly blue leaves and stems. But not grass – at least not that’s popular around here. Oh, wait! I should’ve looked to see if they had some roses! 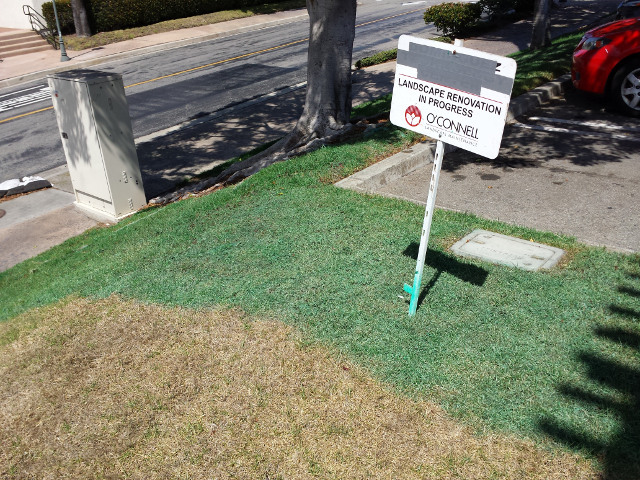 This entry was posted in Highlights, Signs of the Times and tagged drought, grass, Landscape Renovation, Manhattan Beach on August 3, 2015 by Kelson.